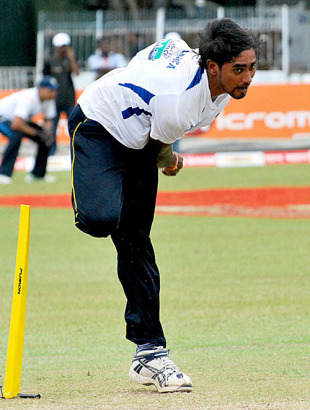 Sri Lanka Cricket (SLC) has made a request to all clubs playing in the first-class Premier League competition to prepare pitches with grass and consistent bounce for the ongoing 2011-12 season in order to encourage longer fast-bowling spells and avoid the frequent recurrence of injuries. Not a series or tour by the senior Sri Lankan team goes by without one or more fast bowlers returning home due to injury, thus upsetting the balance of the team and sometimes well-laid down plans to counter the opposition. This new development has been taking place in the past couple of years and it has prompted the cricket board to find a remedy. The result, according to SLC's vice-president in charge of cricket, K Mathivanan, has been "very encouraging". "We had to find a remedy to stop fast bowlers from getting injured constantly and our coaching unit, after a study, found that the preparation of pitches at domestic matches was part of the problem," said Mathivanan. "When clubs prepare virtually grassless pitches it discourages the fast bowlers, and captains are reluctant to use them for longer spells. This has resulted in these fast bowlers becoming unfit to bowl even 20 overs a day at international level without breaking down." Mathivanan said that SLC took a decision to request the clubs, especially the ones playing in the Premier League Tier 'A' to prepare pitches with pace and bounce to encourage fast bowlers to bowl longer spells. "I am happy to note that the majority of the clubs have got the message and have started preparing good tracks," Mathivanan said. "We took this decision also with the 2015 World Cup in mind. We need to have our fast bowlers free from injury for the World Cup, which will be held in seamer-friendly and fast and bouncy pitches of Australia and New Zealand," he said. Following the World Cup final last April, fast bowlers Nuwan Kulasekara, Dhammika Prasad, Nuwan Pradeep, Suranga Lakmal, Dilhara Fernando, Chanaka Welegedara and Shaminda Eranga have constantly been on the injury list.